When Harbor Club on Lake Oconee was hand-picked as a Southern Living Inspired Community earlier this year the award-winning lake and golf community embarked on an ambitious partnership with the iconic publication that culminated this month with the grand opening of the beautifully conceived Southern Living Inspired Home. Framed by the 11th hole of the award-winning Harbor Club golf course, the Southern Living Inspired Home is open to public tours every weekend through December; Saturdays 10am - 5pm, and Sundays 12pm - 5pm. And the home will be decked-out for the holidays starting Saturday, November 18. There is no charge to tour the Southern Living Inspired model home, although a $10 donation is suggested which will fully benefit the Greensboro-based Circle of Love Center. The center provides direct and support services to domestic violence victims and their children in Greene, Morgan, Putnam, Baldwin and Hancock counties (http://www.colinc.org). The Southern Living Inspired Home is a 3,500-square-foot, four bedroom, four bath plan called The Woodmere, with a modern farmhouse décor with southern chic. The home was built by the community’s in-house homebuilding company, Patriot Builders, and offers a flexible plan on the main floor featuring a great room with fireplace, open concept eat-in kitchen and a formal dining room. Three bedrooms and two full baths flank the central living area with a split bedroom design. 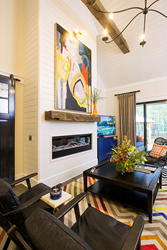 Shiplap and other details adorn the public areas and master bedroom. A cathedral ceiling in the main living space is accented with true re-claimed timber frame beams. The spacious kitchen is offset but open to the living area, and features Woodmode cabinetry, quartz counter tops and professional grade appliances. The luxurious master bath features the same southern chic flair with a European bath twist. Additional second-level finished rooms offer more living space and/or guest bedroom accommodations. And an open-air outdoor living space comes complete with a central fire pit, oscillating fans and a grilling station, while bringing the impeccably groomed golf course into perfect view. The Southern Living Inspired Home at Harbor Club incorporates the latest products and services of Southern Living national program sponsors; Pella Windows and Doors, Lennox Heating and Air Conditioning Systems, and James Hardie Siding and Trim. Southern Living Inspired Communities is a unique collection of residential developments featuring members across five Southern states (Florida, Georgia, North Carolina, South Carolina and Tennessee) that exemplify the Southern Living lifestyle. The neighborhoods are marked by charm, taste, and Southern spirit that embody a distinctive pride of place. They embrace the natural beauty of the Southern landscape, display the best of Southern Living inspired architecture and contain environments that foster communal gatherings. For more information on the Southern Living Inspired Home call 706-453-7855 or visit online at http://www.harborclub.com/southern-living. For more information on Southern Living Inspired Communities go to http://www.southernlivinginspiredcommunities.com. About Harbor Club on Lake Oconee. Harbor Club is a family-owned, 1,000-acre golf and lake community located an hour east of Atlanta and framed by nine miles of pristine shoreline along Georgia's Lake Oconee. Harbor Club ownership continues to invest in the neighborhood and its future by recently devoting millions towards capital enhancements, including an expansive fitness, recreation and special event campus called The Grove, a sparkling new marina amenity and the award-winning golf course. Additional amenities at Harbor Club include an expansive Swim & Tennis Center and a recently renovated clubhouse with a golf shop, special event space and dining room. Harbor Club has partnered with Atlanta-based Ansley Developer Services to form Harbor Club Properties, an onsite sales and marketing team. 706-453-7855 or http://www.harborclub.com. About Southern Living Southern Living celebrates the essence of life in the South, covering the best in Southern food, home, garden, and travel. Reaching more than 16 million people each month, Southern Living connects consumers with the region’s rich culture through a variety of print, digital, mobile, tablet and event platforms. Headquartered in Birmingham, Ala., the rapidly expanding Southern Living brand is part of Time Inc., one of the largest content companies in the world and the largest publisher in the U.S.